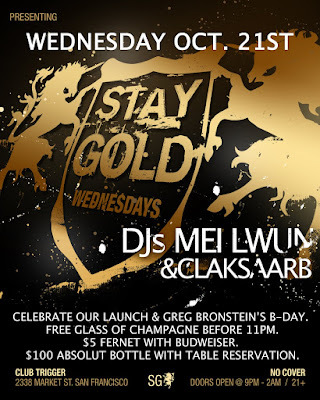 STAY GOLD OCT 21st featuring DJs Mei-Lwun and CLAKSAARB to celebrate our launch & Greg Bronstein’s b-day. free glass of champagne before 11pm. $5 Fernet with budweiser. $100 Absolut bottle with table reservation. Damien Miller of Sapient Photography will be on hand shooting for Nitevibe and 944 Magazine so be sure to dress to express!! !